***Please read through the description of our condo and if you have any questions, feel free to reach out. We keep our calendar updated so if it appears to be available, it is. I'm easy to talk to so get in touch even if your request seems impossible, as it might not be. HOA dictates a 30 night minimal lease. 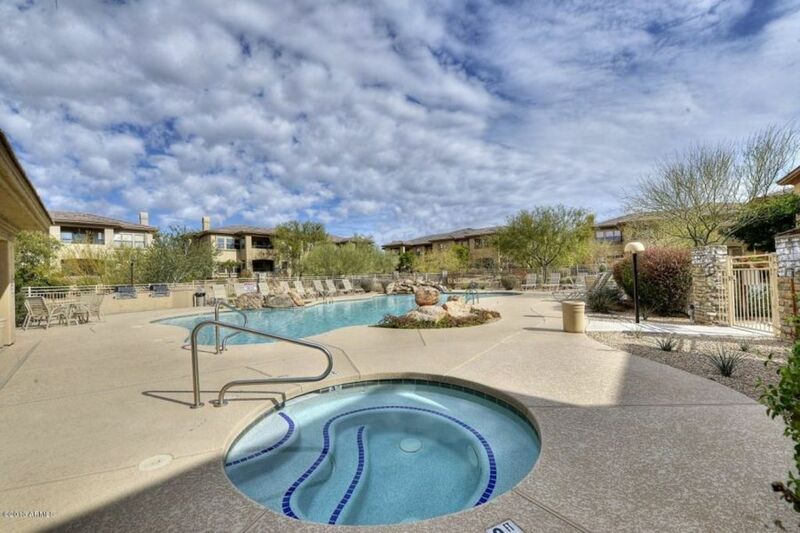 Luxury condo in a gated community in the Grayhawk area of Scottsdale, AZ. This second story vacation condo is ideal for that relaxing getaway or active vacation. Nicely furnished with attention to detail and kept in immaculate condition. Private and quiet. Located in a private gated community in Grayhawk, the area reflects an understanding of a need for balance between activity and comfort. Enjoy exceptional amenities and the benefit of the Grayhawk community and its exclusive events. Spacious kitchen with granite, family room, dining area, bathroom, and patio with ceiling fan. The master bedroom has luxurious pillow top king bed and 50 in, wall mounted television. Walk-In Closet. Just a 40 yard walk to the exercise room with its private pool and jacuzzi, our condo combines the perks of a resort with all the comforts and amenities of home. The guest bedroom has a stylish pillowtop queen bed, lingerie chest, dresser, mirror, jewelry closet and ceiling fan. The second bath has a standard tub/shower. Washer & dryer located adjacent to the kitchen, behind doors. Enjoy immediate access to Scottsdale's finest Golf, Spa's, Dining, and Shopping (KIERLAND, DESERT RIDGE, BILTMORE, FASHION SQUARE), etc. Only a 30 minute drive from Phoenix Sky Harbor Airport. Flat screen TV’s in living room and master bedroom. King bed in master, Queen in second bedroom. The master bathroom has a double sink and large shower. The guest bathroom has standard tub and shower. Great Place!!! This Upscaled Condo was super clean and well equipped. Nice pool area! Awesome location to everything. Our stay was excellent! The condo is professionally decorated and supplied with all the conveniences we could want. Location is ideal. There are restaurants, groceries, and shopping within walking distance. Convenient access to the 101 makes travel to Scottsdale and all of the greater Phoenix areas easy. We took advantage of Arabian Horse Show, LPGA Tournament, numerous affordable golf courses, hiking and biking trails, a day trip to Sedona and much, much more. The manager greeted us at the unit and made us feel at home. Anyone going to Scottsdale, I would recommend this condo. Our stay was for 6 weeks and we wished we could have stayed longer. Thanks for making great vacation memories! Thank you for your kind words Ron and Jolene. I am so happy that you enjoyed your stay and got to take in a lot of what the area has to offer! We stayed in this Grayhawk condo for a week during February '15. It was located in a very quiet, gated community. The garage was quite small and barely accepted a Volvo crossover. The condo was upstairs and very nicely appointed. It was clean and comfortable. The master suite bedroom had a wonderful mattress on the bed along with a wonderful down comfortor. TV's were hi-def withvirtually every cable channel you could want. It was quiet and convenient to the north end of Scottsdale. The rental agent made it easy to check in and out. We would definitely rent it again. Thank you Bruce and Susan, I'm so glad that you enjoyed your stay! I appreciate your taking great care of the property during your visit and for taking the time to post a review. This is a non-smoking property and pets are not allowed.